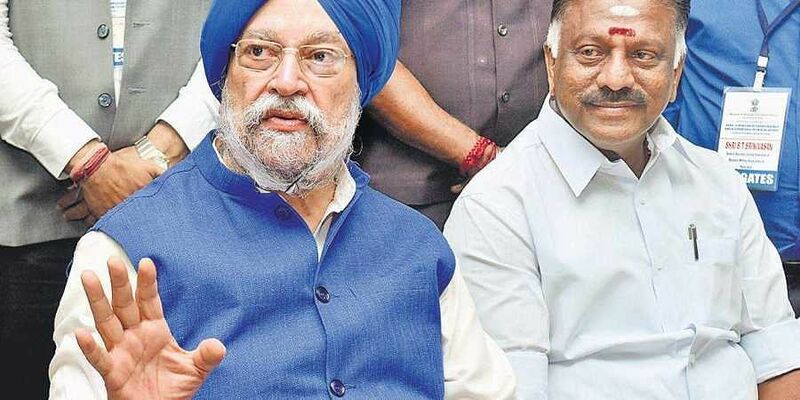 Minister of State of Housing and Urban Affairs Hardeep Singh Puri said the Southern states, excluding Karnataka, managed to register 2.54 per cent projects and 1.6 per cent of agents. CHENNAI: The Centre has urged the State government to appoint a fulltime Chairman of Tamil Nadu Real Estate Regulation Authority and has hit out at the Southern states’ dismal performance (excluding Karnataka) in registering projects with Real Estate Regulatory Authority. Speaking at a regional workshop, RERA – A New Era of Transparency and Accountability in Real Estate, Minister of State (Independent Charge) of Housing and Urban Affairs Hardeep Singh Puri said the Southern states, excluding Karnataka, managed to register 2.54 per cent projects and 1.6 per cent of agents. “There is a need to have a full-time Chairman with designated persons which could generate better results,” he said. He hailed Tamil Nadu for being the first State to nominate a Chairman for Real Estate Appellate Tribunal. He also hit out at tweaking of Real Estate Regulatory Authority Act by States while notifying RERA. He said States should ensure that rules are framed in letter and spirit of the Central Act. The minister also hailed Tamil Nadu in implementing Pradhan Mantri Awas Yojana. “A total of 5.8 lakh houses have been sanctioned under the scheme,” he said and added that the quality of PMAY is impressive. Later, speaking to reporters, the minister said he was not criticizing the State for failing to nominate a permanent chairman. “It is a new law and it will take time,” he said. On fewer registrations, he said the problem will be solved soon. “On implementing new law, there are very minor variations. There have been instances where rules were tweaked on a few projects,” he said. Deputy Chief Minister O Paneerselvam, who also holds the portfolio of housing, said RERA workshop provided an opportunity for both the Central and State Governments along with the stakeholders to review and reflect on the working of the institution in the past 15 months and to consider corrective steps and improvements. Urging the Union government to enhance its subsidy per dwelling unit under Affordable Housing in Partnership (AHP) to at least 50 per cent of the construction cost under AHP vertical, the Deputy Chief Minister O Paneerselvam said the State was left with the task of constructing approximately five lakh houses by 2022, mainly under this vertical. “The Government of India subsidy is only Rs 1.5 lakh. The beneficiary contribution covers only a portion of the cost. This leaves the State government with a huge responsibility – of providing the land free of cost and financing a large proportion of the cost of each house. The Government of Tamil Nadu has already approached the World Bank and will shortly approach the Asian Development Bank to provide long-term loans to finance the cost of construction of a total of about one lakh houses. More resources are being found, including from HUDCO and other sources, including the Shelter Fund,” he said. Stating that FSI across the State is being increased from 1.5 to 2, he said that the draft common Development Regulations and Building Rules have already been put out for public consultation and various other parameters are being modified to ensure that the permissible FSI can be achieved. The government aims to reduce the prices of houses, enhance the ease of doing business in the construction sector, promote voluntary compliance and balance the concerns of liveability and adequacy of infrastructure. He also urged the Union housing ministry to prevail on various Central departments and agencies who have either encroached lands or unutilised lands to free them up for use for construction of houses for the urban poor.